Fuel up at participating Port Angeles gas stations to raise money for our community! 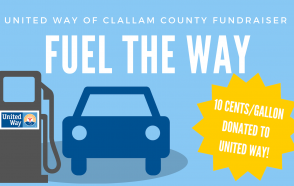 Each station will donate 10 cents/gallon to United Way of Clallam County on their designated date. The stations will also be giving away a $50.00 gas card to one lucky winner from each day. United Way of Clallam County’s mission is to strengthen the community by helping people live safe, healthy and productive lives. The money raised will be invested in the community through 24 local partner agencies that have programs and services focused on education, financial stability and health. Thank you to Bob Lovell (Lovell's Chevron and Roadrunner Shell) for coordinating this fundraiser!